Accessorizing your new iPhone X is a must, and picking the perfect day-to-day leather case can add your personal flair without distracting from your iPhone X’s stylish design. If you’re looking for the ideal leather case, here are a few options to consider as you personalize your iPhone X! If you’re looking for a straightforward, stylish, and practical leather case for your iPhone X, then the iCarer case is definitely an option to keep in mind. The iCarer case is designed with a card pocket, so you can easily slip your essential credit cards, ID, and more into the back of your iPhone for super quick access. The entire case is made from a classic, tanned leather, with a raised bezel for a bit of extra screen protection. The rich tan color has a beautiful, timeless look to it, but if you’re interested in a different color, iCarer makes its leather wallet cases in black and grey too. Protect your iPhone X in leathery style with the Lugano Wallet case from Sena Cases that’s designed to withstand drops, store cards, and give your phone a stylish new makeover. Designed with a rich heritage leather that gives full access to all buttons and ports, the Lugano Wallet is a shock-absorbing accessory designed to keep your iPhone X safe and functional. The inside is made with a soft, herringbone material and design, while the outside comes in a rich, brown leather. While leather cases are a great stylistic choice for your iPhone X, not all of them are the most protective. If you’re looking for a leather case that looks great and can take a punch or two (or three or four…), then the Otterbox Strada series folio case might be made for you. With Otterbox’s certified drop protection guarantee, you’ll rarely have to worry about your iPhone X shattering into a thousand soul-crushing pieces. The Strada is designed with a tough, durable base, with a leather front cover and a card slot, making the case not only stylish and practical, but also extremely protected all around. The case easily snaps on and off and comes in three different colors to match your sense of style, including onyx (black), burnt saddle (burgundy/brown), and pacific opal (dark teal). 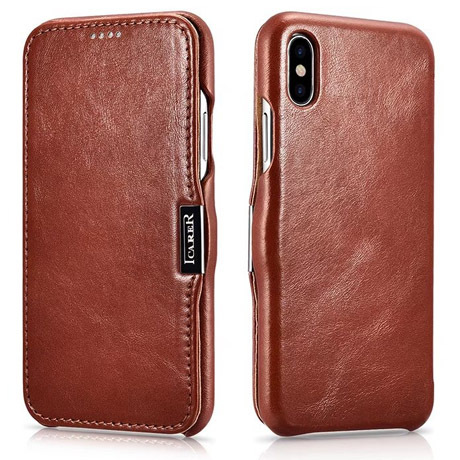 If you’re looking for the perfect leather case for your iPhone X, then why not go back to the source and check out Apple’s iPhone X leather case? Apple’s leather case is made with a microfiber lining to keep your iPhone X somewhat protected and clean, while the design is meant to fit perfectly around the edges of your iPhone without making it feel overly bulky in your hand. The leather case comes with aluminum buttons and access to all ports, meaning you won’t have to slip the case on and off to charge it or adjust the volume on your favorite song. Apple makes its leather cases in a ton of fun and classic colors, including blue, gray, tan, saddle brown, midnight blue, black, and a (Product)Red version. Made from high-quality leather and designed to be svelte, sleek, and stylish, the Benuo ultra slim leather case for your iPhone X is a worthwhile accessory to consider if you’re looking to deck out your new iPhone. The Benuo is made with a double card holder on the back, with full access to all buttons and ports for easy charging and use. The super slim design, while not the most protective, keeps your iPhone X free of bulk, while the soft microfiber lining is made to cradle and protect your iPhone against scratches and dirt. With a bunch of classic colors to choose from, the Benuo adds a little bit of timeless style to your iPhone X with colors like chocolate brown, brown, dark black, and black. If you’re looking for a luxurious, well-made, expensive looking case, then we suggest taking a look at the Grip from Avaja cases. The natural Argentinian leather adds uniqueness and charm to your iPhone X case. The polycarbonate backbone protects your phone without adding heft. While the outside of the phone is made from a premium Bridge leather with a natural luster that only looks better over time, the inside of the case’s lining is made from a super-soft material to protect your iPhone X from scratches, dust, and dirt. The Grip case comes with four corner protection and a slightly raised bezzel to protect your iPhone’s screen. It also comes in a number of cool and eye-catching colors, patterns, and textures, so if you’re looking for a unique leather case, Vaja might be the way to go!